As December 2017 was coming to a close, the simmering wave of discontent took on a sharp turn and erupted into radical anti-government protests which shook the earth underneath the clerical regime and overshadowed all other issues. On December 28, some 10,000 people took to the streets of Mashhad, the second largest city of Iran in the North East, to protest against skyrocketing prices while the general public’s purchasing power is next to nothing. By the year’s end and in a matter of only four days, the protests spread to over 100 cities all across the country. The first day’s “death to Rouhani”- “death to the dictator” rapidly changed to “death to Khamenei” and other slogans directed at the mullahs’ supreme leader from the second day on. The nationwide protests were not only against rising prices, government fraud and corruption, and the clerical regime’s costly involvement in regional conflicts but against the mullahs’ oppressive rule in its entirety. People have been clearly and openly demanding the overthrow of the clerical regime, vowing not to back down until they have toppled the mullahs. They chant, “Independence, freedom, Iranian Republic”, “Let Khamenei know that he is going to be toppled soon”, “guns, tanks, explosives, the mullahs must get lost”, etc. In their angry chants, protesters call the mullahs and the regime’s leaders and officials “thieves” and blame them for the majority of the nation’s destitution. Most remarkably, women are actively engaged everywhere, in every protest, confrontation and venture. Women have demonstrated tremendous courage, fearlessly confronting armed security forces despite being empty handed, encouraging others to not fear and carry on, inviting everyone to join the protests, leading the chants of “death to the dictator”, tearing down the images of Khamenei in every city and fending off security forces trying to apprehend young protesters. As in the past 150 years in Iran, no one is recording the scenes of women’s involvement, however, in the video clips –mostly shot hastily in the heat of hit-and-run encounters with security forces– show glimpses of women and reflect their voice which is louder than others. Eyewitnesses have also testified that women’s courage are a driving force everywhere in all scenes of the protests and demonstrations. How did it start and what was women’s role? The nationwide uprising was sparked by a big demonstration against rising prices and corruption in Mashhad, Iran’s second largest city. Women were numerous, loud and active in this protest which quickly spread to vast parts of the holy city. Eyewitnesses described women’s role in the demonstration as admirably courageous. A daring scene caught on a videotape which happened just on the second day of the protests was created by a woman in the western Iranian city of Hamedan. She shouted “death to Khamenei” for the first time right into the face of security forces surrounding her and then repeated it a couple more times before being whisked away by a friend. The protesters in Mashhad had only gone so far as to chant “death to Rouhani”, the mullahs’ president, and “death to the dictator”, stopping short of openly addressing Khamenei, the mullahs’ supreme leader. But this courageous woman in Hamedan broke the spell, opening the way for other protests where the chants against Khamenei gathered steam. Women were also very outspoken in defying the regime’s security forces in the face. Short video clips hastily shot during hit-and-run clashes between demonstrators and security forces also show glimpses of young women disobeying security officers or engaged in clashes with anti-insurgency units in Isfahan, central Iran. In another picture going viral on the internet was of a young woman outside Tehran University covering her face and holding up her fist in the air as she runs from tear gas. A young woman has been caught on the video tape while challenging security forces during the protests in Zanjan, northwest of Tehran. There are a considerable number of video clips showing large presence of women in the demonstrations in all major capitals. And of course, dozens of women have been brutalized and violently arrested by the regime’s repressive forces and anti-riot units. Of course, this is just the beginning. Women are going to play a greater role and have great impact on the anti-regime struggle and democratic movement. Having borne the brunt of repression for almost 40 years under the mullahs’ rule, Iranian women are the force for change, a compressed coil that is going to spring out even further as the spell of repression is removed. The world witnessed this to a certain extent and on a general level during the 2009 uprising. 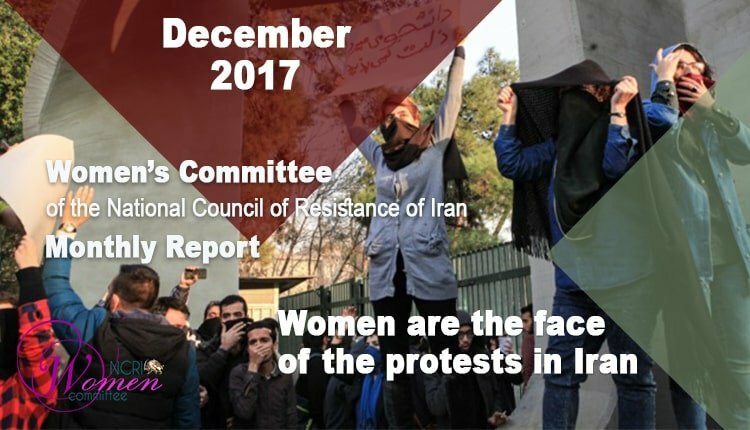 Before the recent uprising begins, women also played an impressive role in the protests of various social sectors, as reported by the Women’s Committee of the National Council of Resistance of Iran in the months of September and October. By December 28, they took part in at least 68 protests across the country by students, teachers, nurses and interns, retirees, plundered people, and other discontented social sectors. Their chants were more radical, targeting heads of the three branches of the government. In one of the protests in Rasht, capital of Gilan Province in northern Iran, participants were mostly women who pelted eggs and rotten tomatoes and sprayed paint at the building of the credit institution which had plundered them. In Ahwaz, capital of Khuzistan Province in southwestern Iran, protesters followed a woman leader chanting anti-government slogans. In a Tehran protest on December 26, called by the wife of an imprisoned labor activist, at least ten women were violently arrested and taken to jail. In Kermanshah, a woman was injured when the protest on December 12 by cheated depositors outside the Governor’s Office was attacked and pepper gassed by security forces. On December 8, a woman by the name of Khadija Nissi was arrested in Ahwaz for singing in a protest against the attacks by Army troops on December 3 and 5 on an Arab village in Dehloran where they brutalized and gassed the farmers, including a large number of women, to confiscate their lands. At least seven women were arrested and jailed. December 10 marked the World’s Human Rights Day. Nevertheless, in Iran, the regime continued to hand out cruel, inhuman and degrading punishments and arrest women and men for failing to observe gender segregation in parties at their homes and elsewhere. New death sentences were issued for two women by the names of Kimia and Mojgan. Two Kurdish women activists, Zamaneh Zivi and Manareh Malaviseh were arrested, and each fined and punished by 50 lashes for participating in the referendums on independence of the Kurdistan of Iraq. Two women by the names of Soheila Zobeiri and Kobra Khalandi were taken to serve their jail sentences for participating in protests against killing of innocent people. An unnamed middle-aged woman was sentenced to do forced labor at a mortuary, washing the dead, on the alleged charge of having illicit relations with a man, a charge which she denied. Officials of a girls’ school in Islamabad, Orumiyeh (northwest Iran), cut the students’ hair in the presence of security forces to make them wear a headband underneath their veils to completely cover their hair. At least 24 women and men were arrested on December 2 in Arak (Markazi Province), 35 on December 29 in Varamin (southwest of Tehran), and 230 on December 21 in Lavasan and Farmanieh (north of Tehran) for participating in mixed-gender parties. A group of women and men were also arrested for participating in a mixed-gender hairdressing course.